Maybe I've always been a little overprotective. But the fact of the matter is, I've always cared deeply about my students. When I call them my students, I'm not simply being possessive; I've assumed responsibility for them, perhaps like foster children, who have been entrusted to my care for a while. It's true that they don't all need my care, but pressed, I would probably tell you that I love them anyway. Which may be terrible professional practice, unless you're a Freirian (maybe I am, a little). When I started working where I am now, I was responsible for sending them off on Fulbrights: helping them to prepare competitive applications, helping them to think about what they wanted to do, helping them to dream broadly and ask larger questions, encouraging them to go out into the world and do good ambassadorial work. Now, a year later, I have something more like my own brood, like I used to have years ago: a group of students I get to meet in freshman year, whose stories I get to hear and watch unfold through their college years. I encourage them to go out into the world, too. The one-off relationships were easy; a little sad, perhaps, because after that period of intense connection they'd disappear (if I did my job well), but at least I couldn't get too attached. And I could comfort myself with the knowledge that even if they were doing academic work, they were brokering peace. I worried about them, but not in the way that I worry about my students now. As I watch the news lately, my reaction to the violence is the world has been visceral. I listen to NPR talk about small boys killed while playing on the beach, and even if I didn't have small children of my own, it would make me want to throw up. I listen to the reporters from the BBC talk about being handed the personal effects of someone flying on that ill-fated Malaysian jet, and I find myself weeping. I think about the small sparks that started world wars, and I wonder, even as I never wondered during my Cold-War childhood throughout which the spectre of global thermonuclear destruction loomed menacingly from abroad, if these sparks will be the ones to catch. I live in a relatively protected little corner of the world. But my students are out there. Some of them travel out there, and some of them live out there. One of them texted me from Norway the other day with the travel warning from the Embassy about a possible Syrian terrorist attack. One of them is trying to figure out how to get to Israel to do senior thesis research, even though she can't land in Tel Aviv. Some of them are from Malaysia, from the Netherlands, from Iran, from Russia, from the Ukraine. They bring the world to my doorstep in 4D, 24/7, in a way that the radio and the internet can't. And it's people like them--innocent civilians, young people full of promise--that are getting caught in the crossfire of misunderstanding. In the face of that reality, my hashtag activism and my spatula feel woefully inadequate. I'm not at BlogHer'14 this year. Part of me is disappointed, because it's been good motivation to write and think, and it's been a useful way to meet people who are from a different tribe. There was a session yesterday on "Deep Blogging," and I'd be curious to know (beyond what I was able to glean from the Tweetstream) what the conversation looked like there. I think that on some issues, hashtag activism can be incredible powerful--domestic violence, boycotting of organizations that support unethical practices in their own business or among those with whom they do business. But in matters like this? I'm lost. How do you intervene in a controversy that's not your own, and demand peace? Unless you're John Kerry, how do you get people from different nations to break bread? (Come to think of it, John Kerry isn't having such good luck, either.) Besides worrying over the students who send you texts from faraway places, what is your role in ending this madness? Are you supposed to watch in horror? Post things about the way you feel to Facebook, where everyone will nod sagely and agree that yes, these things are horrible? I made Borek the other day. I was trying to use up some frozen phyllo, and I found some recipes online that looked worth a try. As I dug a little deeper, I realized I'd found a dish that had been eaten on tables in many of the places in the world I worry about. At the risk of sounding naive: I wish that some of the people in those places could sit down to one table, and realize that while everyone has a slightly different take on the dish, they were, in essence, all eating the same thing. This dish has variants made in Turkey, Albania, Syria, Armenia, Bulgaria, Greece, Israel, Italy, Crimea, Serbia, Macedonia, Croatia, Montenegro and Slovenia, Bosnia, Algeria, Moldova, and Russia. It's found on Jewish, Christian, and Muslim tables. Whisk 2 T. olive oil, milk, whole egg, yogurt, salt and pepper in a bowl until combined. Set aside. Heat 1 T. olive oil in a large pan. Add the chopped onion and saute until fragrant, 3-5 minutes. Add the spinach, salt and pepper; cover and cook over medium heat until the spinach loses most of its volume, about 5 minutes. Stir and cool for 15 minutes. Strain the juices from the spinach, and combine it in a bowl with the feta cheese; stir gently until combined. Line a large baking sheet with parchment paper and lightly spray it with vegetable oil. Place 2 sheets of phyllo dough on the parchment and brush it with 3 tablespoons of the milk mixture, being careful to work quickly and not tear the dough. Repeat the process one more time. 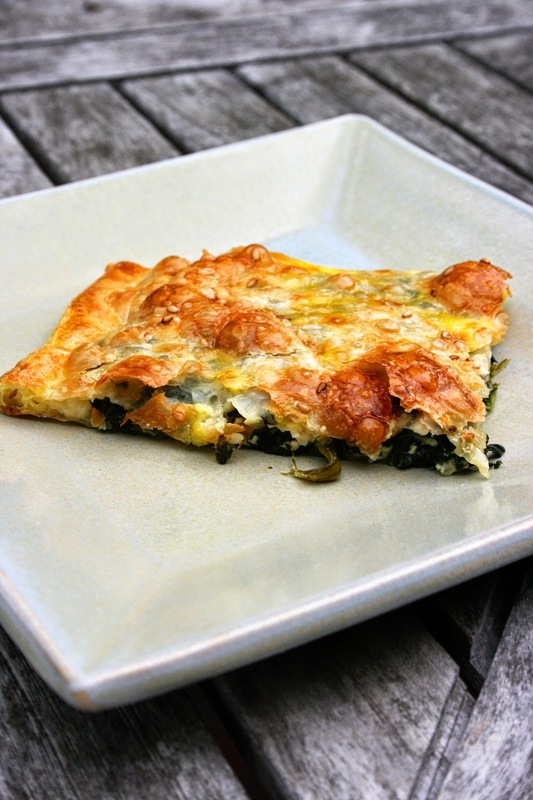 Place 1 sheet of phyllo dough and spread the spinach-feta cheese filling evenly leaving ½ inch space on the edges and corners. Continue with placing 2 sheets of phyllo dough and brushing it with 3 tablespoons of the milk mixture two more times, and then place the last phyllo dough on top and brush it with 2 tablespoons of the milk mixture. Cover it with plastic wrap and refrigerate at least 2 hours or overnight. When ready to bake, heat the oven to 350 F. degrees. Slice the borek and brush it with 1 egg; sprinkle each piece with sesame seeds. Bake until it is golden brown, 30-35 minutes, and serve immediately. I must have been about twelve, because it was my brother's First Communion. Old enough to know better, I guess. It was May, and the adults had all gone inside to escape the unseasonably warm and humid afternoon. Four or five of us had stayed outside, and were fooling around on the swing set. Across the yard, on the concrete slab my father had constructed around the kamado (which my father owned because a simple barbecue grill would have been too commonplace, and my father hardly ever did anything that was common), I saw it: the sangría pitcher, emptied of everything but the fruit. I don't know whose idea it was first, but someone dared someone, and it became funny for my brother to feed me drunken fruit bits while I hung there upside down on the monkey bars. I was probably lucky I didn't choke, but that particular thought never crossed my mind on that mosquito-filled day. I was thinking, instead, about how sweet the fruit was, how refreshing, how cold, still, even though the liquid was long gone. At some point, an adult remembered us and came outside to find out what we were doing; upon finding me, mouth full, breath ever-so-slightly alcoholic, she started laughing, and informed my father he might want to bring his pitcher inside. 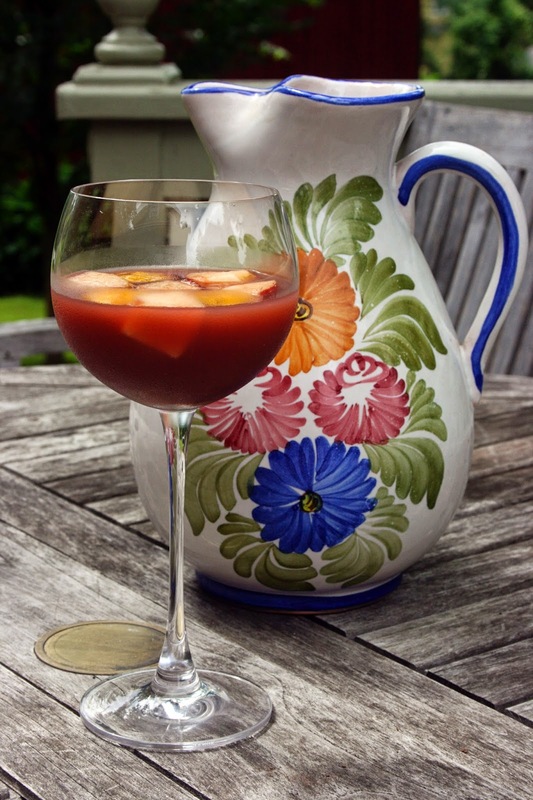 My father prided himself on his sangría, and along with kamado-grilled sausage sliced on the diagonal and served with tiny colored plastic forks, it was the staple of every summer gathering at our house. In Spain, children were permitted to drink some version of this (wine watered down with sparkling water), so we were allowed small sips, too. As I grew up, I'd open the freezer to find large plastic sherbet containers full of fresh-squeezed Valencia oranges (with chunks of orange added), awaiting the next event. Once, after my father died, I found some orange-ice blocks in the freezer, and I spent months wondering what would become of them, now that the sangría-maker of our house was gone. Years later, when I ran my first trip for students and faculty to New York--a trip that nearly ended in disaster because of a bus fire and two hour wait for a new bus between two exits from the Holland Tunnel--I bryought the group to the restaurant of a family friend in the Ironbound, where she poured sangría for everyone (an act to which administrators turned a blind eye that night), and to this day, former students and faculty still remember that trip, still talk--laughing--about the sangría, which was my father's recipe. I've sometimes wondered about origin of the word "sangría," which means "bloodletting"; red tint of the traditional version aside, it always seemed to me to be a violent word for something so congenial. I don't know why it took me so long to make it myself, but the other day, going to a friend's house for a girls' night in, I decided to bring some. I made orange juice ice cubes, as my father would have done, and when they were sufficiently frozen, pulled out the pitcher that he used to mix his drinks in: the one he'd brought back from Spain. I found myself wishing I could call him, to make sure the proportions were right, to ask about varieties of apples, the size of orange slices--really, to hear him swell with pride as I mixed his recipe with a split wooden spoon, as he used to do. After I let the orange juice ice cubes melt a bit, watching the air condense on the bottom of the pitcher, I poured myself a glass; it was exactly right, tasted like the summer of my youth. We lingered over dinner and glasses, enjoying each others' company and conversation. And the next morning, I sat contentedly at my kitchen counter, popping small bits of leftover soaked fruit into my mouth for breakfast, feeling a strange urge to hang upside down. My father would share his recipe this way: "one third, one third, one third." Which, of course, meant nothing unless he also happened to tell you that the "thirds" were orange juice, wine, and 7up (not Sprite, and for God's sake, not diet). Squeeze as many Valencia oranges as you can stand. Measure the juice so you know how much you have, and pour it (along with a bit of coarsely chopped orange) into an ice cube tray, preferably one that makes large cubes. Freeze well. When the orange cubes are set, place them into a large pitcher. Add as much red wine and 7up as you had orange juice. If you don't think you'll have enough to drink, go ahead and add some orange juice (don't bother to freeze it first), with more wine and 7up. Toss in a few Braeburn apples and at least one more orange, both coarsely chopped. Let the whole thing sit for about half an hour before serving. Taste it before you pour it for everyone else. No one will be the wiser. I have started and trashed countless blog post drafts during the past two and a half months. Somehow, everything I write feels either trivial or--when it's nontrivial--overplayed. It's been a doozy of a summer, both in the domestic and world media and in higher education news: the shootings in Santa Barbara in June, the public conversation about sexual assaults on campus, heightened violence in the Middle East, the plane crash in Ukraine, revisited discussions about mental health on campus (which I'm sure we will continue to revisit, especially now in the wake of a very public suicide, even if he wasn't a college student), the crisis in Ferguson, the spate of articles about why people shouldn't be sending their kids to Ivy League schools (which is, at its core, a question about meaning and purpose in college and in life, and whether it's possible to educate for a soul -- which, I'll add, was a question that Plato was askingin 400 B.C.). I feel sometimes like I'm living at the end of days, and part of me wants to pontificate about it, but part of me thinks that the world doesn't need another Cassandra, or another contributor to Modern Jackass. This blog tends to thrive on two other ingredients, besides things to talk about--new food to photograph and thoughts from my yoga teacher--and those have not exactly been in abundance, either. Given a schedule that gets me home at 6, or even later, I've been making meals that people around here (primarily small people) will eat without complaining or spending hours sniffing at it, and may even eat in my temporary absence. And I've been to my regular yoga studio maybe three times this summer, two of which my regular teacher wasn't there. Some of my blogger friends are putting old blogs to rest and starting new ones, or taking a step back from their blogs altogether to do new things (here's looking at you, Coach Kathy), or taking a step back because life has gotten complicated, or just doing new things (well, Mel is always doing new things). Part of me thinks I should shred this thing and start over. The formula is great, but also incredibly limiting and time consuming to get right. Part of me thinks I should face the fact that I'm not making enough time for this space, formula or not. But my blog is also sort of like an old friend that I'm not ready to give up on yet. In the past few weeks we've been inviting over some old friends and new friends, connecting the third side of mostly-formed friendship triangles, celebrating the end of summer by seeing some of the people we've meant to see all along. Type A that I am, this entails much too anxious preparation of too much food, even though people always bring their own contributions to the feast (I did actually make a few new things that I didn't photograph because I was too busy making and serving them), Tetris-like configuration of the refrigerator, and eating leftovers for days on end. But every time I'm sitting with our company at the end of the evening, listening to the crickets or admiring children chalking pictures on the walkway or watching the light fade from the sky, I marvel to myself how perfect it was, how I didn't need to make it difficult at all, because the company itself was more than enough. My yoga teacher did say one thing I've been mulling over this summer, during the class I was able to get to: she said that the more advanced a student became in yoga, the more simple the yoga itself. We begin with elaborate asana, but as we become more proficient yogis and yoginis, we don't need all of that. The breathing is enough. The practice of mindfulness is enough. It seems counterintuitive, but if you think about it, that makes sense: as you grow in understanding of almost anything, you appreciate the complexity and beauty and elegance of the simplest problems. Consider yourself invited to the end-of-summer potluck at A Half Baked Life. If you're still reading, drop in for a bit. Tell us what you're bringing. Be anonymous, if that's easier. We'll reconnect one old friend to some other old and new friends, and see what happens. For the time being, I'll shred carrots (which are still in season at our CSA) instead of a blog. This is not a particularly fancy salad, but you'll appreciate the complexity of flavors. 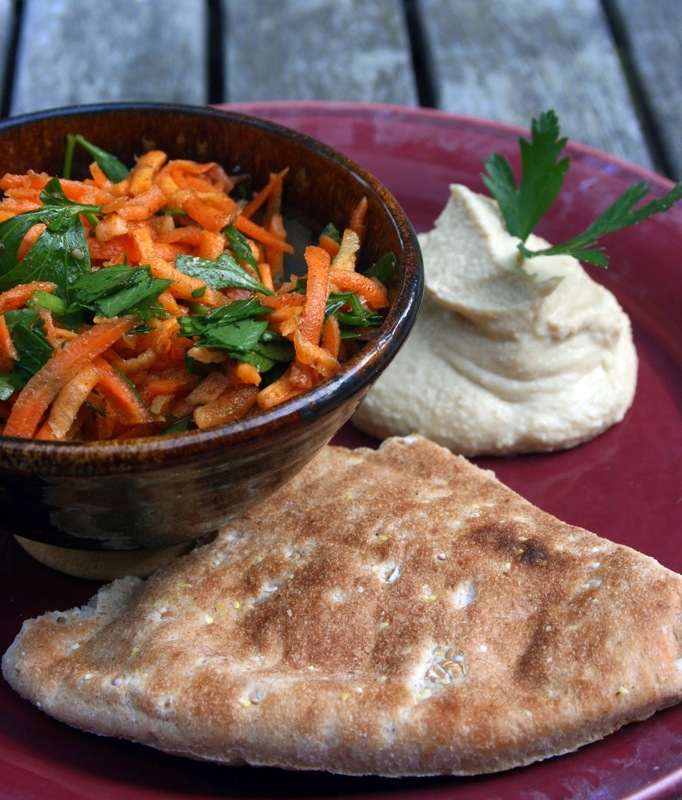 Serve with some toasted pita and hummus, or babaghanouj if you like. Coarsely shred the carrots in a food processor or julienne them, if you're feeling ambitious. Set aside. Heat the oil in a small skillet over a low flame; add spices and stir occasionally until the mixture darkens and turns fragrant, 2 to 3 minutes. Remove from the heat and let cool. Pour the spiced oil over the carrots in a large bowl or container. Add the agave nectar, lemon juice, and sea salt and toss gently until the carrots are evenly coated. Just before serving, gently stir in the parsley.